CAROL LORRAINE, M.A., Spirit Artist, Certified Joyful Life Coach, Leadership Development Consultant, Speaker, Author, and Spiritual Creativity Mentor. I love to awaken JOY, creativity, aliveness and authenticity in others. I mentor women in midlife transitions to find their JOY & FREEDOM, and to live a SOULFUL LIFE of purpose and passion. I masterfully guide and mentor people to live their visions, express their passion and make their dreams a reality. This is joyful living! 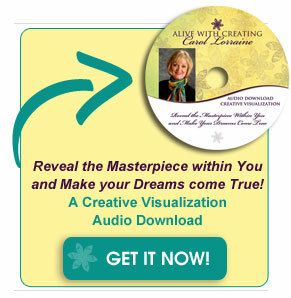 While I am well known for my colorful inspiring artwork of circular mandala drawings and hand-painted silks, my patrons, students, and clients share that they are inspired most by my message of living authentically, courageously, and joyfully. My philosophy is that you are the artist and your life is your work of art. That is what it means to be Alive! with Creating. I have mentored and coached over 1000 people in my Alive! with Creating Coaching Programs, Creativity Workshops and Classes in addition to live events and weekend programs. My clients have transformed their lives and businesses into viable works of art that they love! In my career as an artist, designer, and teacher I have designed, produced and shown a line of art-to-wear specialty garments and won awards for my hand-painted silk jackets. I've taught art, drama, and music at the elementary and college levels. Over the years, I enjoyed being interviewed on San Francisco Bay Area radio and television programs. Considered a renaissance woman by many, I integrate my JOY, love of beauty, nature, and creativity into everything I do. I enjoy living my vision in the beautiful Napa Valley in northern California and delight in sharing the opportunity to be in the flow and experience paradise within! The Entrepreneurial Spirit: Since 1987 I have been an entrepreneur specializing in coaching others to start and expand profitable businesses and meaningful lifework. Professional Life Coaching: Certified by the International Coach Federation in 1998, I trained through The Coaches Training Institute and Living Your Vision™ Enterprises. I love to support, inspire, and motivate people while keeping them focused on their goals. I coach others to start and expand profitable businesses and meaningful lifework. Creativity: Earning my Master of Arts Degrees both in Costume Design and in Creation Spirituality, I use my talents in costuming, mask-making, puppetry, watercolor and music, to awaken people’s joy and creativity. 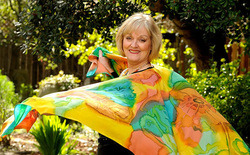 Carol Lorraine Designs are painted with exuberant joy, a passionate free spirit, and a deep love for nature. I hope you'll experience an aliveness within you when viewing or wearing my exciting colorful silks. My artistic background includes work in the San Francisco Bay Area as a puppeteer, costume designer, ColorStyle designer, and image consultant. I combine my background with a Master of Arts in Costume Design and a Master of Arts in Creation Spirituality to create Joyful Wearable Art with Heart. adults for over forty years. My Creative Heart Playshops for women have been successful in helping people to explore and develop their creativity. I love to guide others to express their joy and authenticity through my transformational soul purpose life coaching programs, Alive! with Creating. A music lover, I delight in playing the piano, drums and percussion and singing in harmony with others. Residing in the beautiful Napa Valley, California I paint from my home studio, inspired by the dynamic coastal mountains and breathtaking rich colors of the sprawling vineyards aglow with the changing seasons. I love spending time on the Big Island of Hawaii every year where I swim with the spinner dolphins, visits old friends, and am inspired by the tropical beauty and colors!